I also added a buzzer for feedback, the one I used makes a sound when the signal pin is driven low. Here's the sketch that's running on the Arduino. As you can see the transmission speed is fixed (though it wouldn't be hard to make it adapt to the observed speed). If you're a Morse code enthusiast, I also recommend my Android application that listens to Morse code using your smartphone's microphone and translates it to text. Can you post your codes? 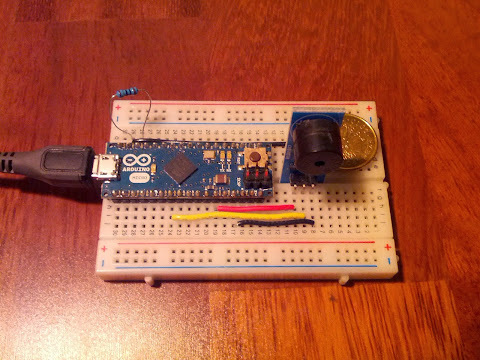 The Arduino sketch is linked in the post. Hi! I am an italian university student (IT) and I'm developping an app about morse code decoding. I see that your android app (Morse Code Reader) is exactly what I was looking for (you did a great job!). I was wondering if you could send me the source code about the part that decodes the audio stream in text (by microphone). I'm having big troubles with this part. If you could help me I'd really appreciate that. Thank you Jacek. I built this keyboard, but looks like my sensor is very sensitive. Any help to correct this is highly appreciated. Thank you. Could this possibly be implemented into some sort of iambic (paddle) key type of board?